Temperature-dependent electrical characterization of high-voltage AlGaN/GaN-on-Si HEMTs with Schottky and ohmic drain contacts_News_SiC Wafer,GaN Wafer,GaAs Wafer,Ge Wafer--XIAMEN POWERWAY ADVANCED MATERIAL CO.,LTD. We fabricated HV AlGaN/GaN-on-Si HEMTs with Schottky and ohmic drain electrodes. We examine impact of temperature on the electrical parameters of fabricated devices. The use of Schottky drain contacts increase the breakdown voltage from 505 to 900 V.
The SD-HEMTs are characterized by lower increase of Ron with increasing temperature. 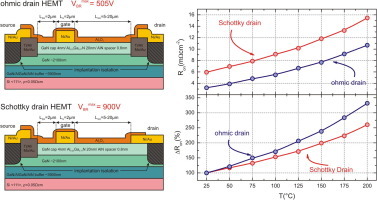 In this work we present results of electrical parameters characterization of high-voltage AlGaN/GaN high electron mobility transistors with ohmic and Schottky drain electrodes on silicon substrates. The use of Schottky-drain contacts improves breakdown voltage (VBR ), which was VBR = 900 V for LGD = 20 μm in contrast to VBR = 505 V for ohmic-drain contacts. Both types of transistors exhibit drain current density of 500 mA/mm and leakage current of 10 μA/mm. Temperature-dependent characterization reveals a drain current density decrease with increasing temperature. The Schottky-drain HEMTs are characterized by lower increase of the Ron (ΔRon = 250% at 200 °C) in comparison to ohmic drain contacts (ΔRon = 340% at 200 °C) relative to the room temperature due to decrease of on-set voltage of Schottky-drain HEMTs. If you need more information about AlGaN/GaN-on-silicon, please visit:http://www.qualitymaterial.net or send us email at sales@qualitymaterial.net.